*This offer is valid at ALL El Charro Café locations. 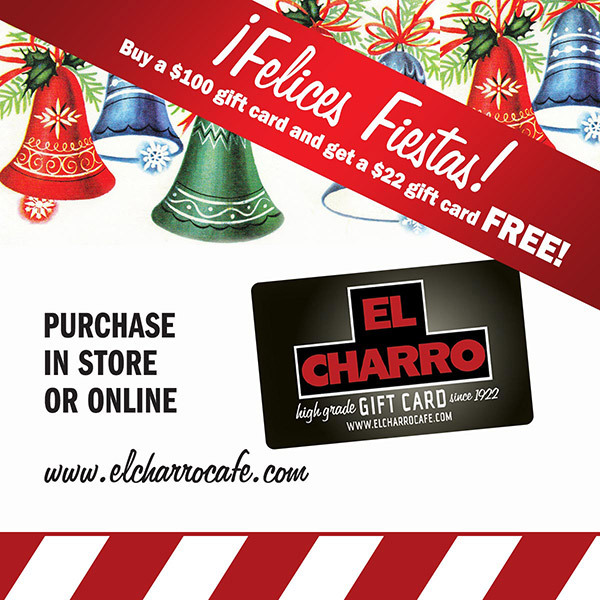 Buy an El Charro Café Gift Card at a minimum of $100 and get a second gift card of $22 value for free. Offer good only in minimum increments of $100. Rewards Family Points cannot be used to purchase cards and points cannot be earned for Holiday Gift Card purchases or redemptions. May not be combined with other offers or discounts and certain restrictions and additional costs may apply.